Food Costs > How Much Do Brussel Sprouts Cost? How Much Do Brussel Sprouts Cost? Brussel sprouts are a good ingredient for a fresh salad, a topping for bread or steamed with other vegetables like carrots, cabbage, lettuce, and potatoes. Belonging to the same family as kales, bok choy, and cabbage, Brussel sprouts look like miniature heads of lettuce and can come in a variety of forms. The cost of Brussel sprouts will depend on how you’re purchasing them, the time of year and where you’re purchasing them. On average, fresh Brussel sprouts will cost anywhere from $3 to $5 per pound. Frozen Brussel sprouts, on the other hand, can cost $1.50 to $5 per bag. According to Frugalvillage.com, fresh Brussel sprouts can cost around $3 to $4 per pound, while frozen ones cost about $2 per pound. A highly rated seller on Amazon sells one pound of Brussel sprouts a pinch more than the estimates mentioned. At the grocery store, Brussel sprouts are usually available either fresh or frozen. Frozen Brussel sprouts will come in a clear plastic bag, commonly found in the frozen food aisle with other frozen vegetables. Popular quantities at your local grocery store, such as Walmart, will be 11, 16 or 48 ounces. Brussel sprouts are a leafy green vegetable that won’t grow more than 1.5 inches. High in vitamin K, they are commonly eaten boiled, steamed, sauteed, roasted or raw. Ocean Mist Farms offers some simple recipes for each method. According to fitday.com, there are three main reasons that brussel sprouts should be included in your diet. First, they are a great source of sulforaphane, a chemical that is thought to help fight off cancer cells. 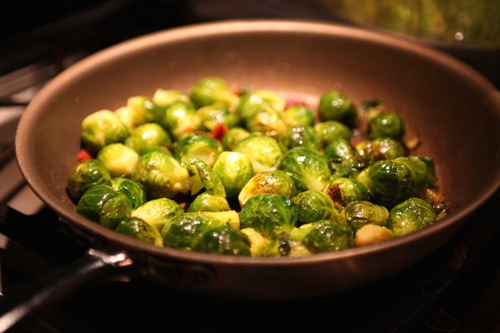 Secondly, Brussel sprouts are very low in sodium and fat and have no cholesterol. Finally, they contain high amounts of vitamin C, a vitamin that helps the body form and maintains connective tissue, including bones, blood vessels, and skin. When selecting, look for a firm, compact and brighter green head. If you can, always try to buy on the stalk. There should be no yellowish colors, wilted leaves and the texture shouldn’t be soft. You can store Brussel sprouts inside your refrigerator for up to 10 days. You can save money by purchasing in bulk. At Costco, for instance, a two-pound bag retails for less than $4.50. Check out your local farmers market for fresh Brussel sprouts. Oftentimes, this is not only a cheaper option, but you’re buying directly from the farmer. Consider growing your own Brussel sprouts in your backyard or garden for a fun hobby and as a way to save. If purchasing a name brand frozen bag, consider looking for coupons ahead of time to see if you can save. San Angelo’s new Walmart is charging $4.97 EACH for Brussel Sprouts !!! !